This contemporary five-star chalet is in a quiet cul-de-sac, just a few minutes drive from the busy market town of Thônes, which has a great choice of shops, restaurants and a good weekly market. There’s also a large supermarket less than a kilometre away. Despite being so close to the town, the chalet is surrounded by mountains, and overlooks a meadow, so peace and quiet is assured. 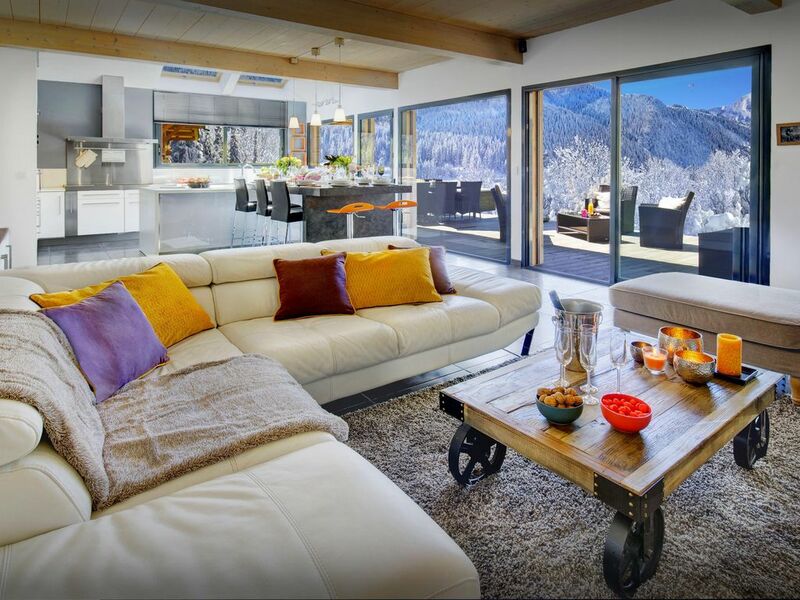 This enviable location makes Chalet de Rollon a great choice for skiers, non skiers and summer visitors, as there is so much to see and do just a short drive away. Or out of season why not treat yourself and come and work from the comforts of the home office instead of your normal office? The owner's love of the mountains is reflected in the framed Alpine views on the walls and each of the bedrooms is named after a famous mountaineer. This modern mountain home sleeps 9 (8 adults and one child) in four double bedrooms, one of which has an adjoining single room. The ground floor bedroom has a double bed and access to a laundry and dressing room with a sink. Upstairs there is a double bedroom with an en suite shower room, and two more double bedrooms, one of which has steep stairs to a single bed under the eaves, which is suitable for a child (although not a toddler). The other double room can be arranged as a twin room. Also on this floor are a bathroom and a shower room which are linked by a sliding door, a useful tv/reading area on the landing, and a home office with a view to die for. The bright and airy living space on the ground floor has a large modern kitchen and dining area with access to the sunny terrace, and a seating area with a large modular sofa, bench seats and a woodburning stove. The owner has chosen natural materials such as slate, wood and leather with restful neutral shades for the decor, which reflect the Alpine surroundings. Framed prints of local views will leave you keen to explore your surroundings! The garden is screened from neighbouring properties with large shrubs so you can enjoy the jacuzzi in privacy, and the large terrace is perfect for eating al fresco. Chalet de Rollon is in a great location to make the most of the winter sports offered in the Aravis ski resorts. Less than 20 minutes from the ski stations of La Clusaz and Le Grand Bornand, you can ski somewhere new every day. Your Aravis ski pass also covers the Manigod area, giving you 220km of pistes of varying levels to explore, as well as extensive off-piste action. Parking is available at the ski stations, or use the network of ski buses, which are free with your Aravis ski pass or the Carte d’hote. Cross-country skiers will discover a great variety of trails from nearby St-Jean-de-Sixt - pick up a map from the village tourist office. Non-skiers are particularly well catered for at Chalet de Rollon which is an easy walk or drive from Thônes, where you will find plenty of shops and restaurants and a cinema. If you fancy exploring the mountains try snow-shoeing, sledging, dog-sledding and sleigh rides. After a busy day, Chalet de Rollon is the perfect retreat - enjoy a jacuzzi under the night sky or curl up on the sofa for a cosy night in. When you choose Chalet de Rollon for your summer holiday in the Alps you can enjoy the best of both worlds - mountain adventure and lakeside relaxation. The mountain resorts of La Clusaz and Le Grand Bornand are less than 20 minutes away by car and you could be at the beautiful village of Menthon St Bernard on the banks of Lake Annecy in 15 minutes. Annecy itself is just a little further away. St-Jean-de-Sixt, just minutes from the chalet, is one of the few places where you can try Bun-J ride, a cross between ski jumping and bungee jumping! Other more traditional pastimes are available too - marked footpaths crisscross the mountains, or you can explore by mountain bike or on horseback. There are indoor and outdoor swimming pool complexes in Thônes, Le Grand Bornand and La Clusaz, or if you're looking for something a little more challenging, there are climbing schools, via ferrata routes, tree-top adventure parks, canyoning, white-water rafting and paragliding all nearby. PLEASE NOTE: there is single mezzanine bedroom accessible from the double bedroom on the left at the top of the stairs. The stairs are steep and headroom is limited as the bedroom is under the eaves therefore this room is meant for a child from the age of 6/7 years or a teenager. This room means that the total possible capacity of the chalet is in fact 9 rather than the 8 listed on the website. PLEASE REFER to the notes in the chalet guide regarding safe and respectful use of the jacuzzi. If extra servicing and cleaning of the jacuzzi is required because the guidelines have not been observed, the amount for the extra cleaning will be deducted from the security deposit. IMPORTANT : Until 31/12/2018 the local tourist tax (Taxe de séjour) is of 1€ per adult per night and you will have to pay this amount to the property manager on arrival. From January 2019 this tax will be of 2€ per person per night. Please contact the local town hall for more information. I would not hesitate to recommend this chalet. The chalet was incredibly comfortable, clean, modern and the kitchen had every piece of equipment you could ask for. We were a group of 9 (5 children and 4 adults) and the chalet was very spacious. We skied in Le Grand Bornand which is about a 20 minute drive from the chalet depending on traffic. I would not hesitate to recommend this chalet. We had a fantastic holiday at Chalet Rollon. It was beautifully fitted out to an excellent quality. The views were amazing. Lots to do in the area, includind the proximity to the ski resorts for some lovely walks and alpine activities, and also some lovely beaches. Thones itself was lovely and had everything that you needed. Sophie was a great host, being very friendly and helpful, recommending some great things to do and go. Yet another fantastic stay at our favourite house in our favourite location ! Sophie as always was very helpful. We really loved the location of the chalet, the gorgeous property, the hot tub. We enjoyed in the area : town, mountains, countryside, and lake. The property was immaculate, we can't thank you all enough and we will definitely be back. The chalet was really well kitted out and the facilities were great. So much to see in this area but not enough time. Will definitely be back. Thank you Sophie (the manager) for your assistance. Our second stay at this wonderful chalet ! We like everything about this place. Our family had a great time. Thanks !